"I want the middle seat!" exclaimed no business class passenger ever, so Emirates is finally removing it from its Boeing 777-200LR (long-range) jets, while also ditching its old 'sloping sleepers' in favour of much-needed fully-flat beds. The upgrades also provide larger inflight entertainment screens and introduce personal minibar facilities at every seat, and there's a new snack bar and social area in the centre of the business class cabin where you can stretch your legs. But despite the upgrade, you won't find seating in a 1-2-1 layout, as many business travellers have come to expect: instead, a six-across, 2-2-2 configuration: certainly better than the old 2-3-2 arrangement, but not as favourable as having direct aisle access at every seat, such as Emirates' Airbus A380s already provide. Currently serving selected flights between Adelaide and Dubai and longer routes to places like Fort Lauderdale (USA), Brazil and Chile, Australian Business Traveller stepped aboard a return Dubai-São Paulo flight to put Emirates' newest seat through its paces. Frequent flyer program: Emirates Skywards by default, although Australian travellers can choose to earn Qantas Points by attaching their Qantas Frequent Flyer number to the booking instead. Just note, Qantas status credits are only earned with Emirates on QF codeshare flight numbers, and Qantas doesn't codeshare from Dubai to Brazil. Carry-on baggage allowance: 1x113cm bag, plus either a 100cm briefcase or a garment bag of up to 20cm in depth when folded, with each item weighing no more than 7kg. Checked baggage allowance: Unlike the normal 'weight allowance' of 40kg for business class as you'd get with Emirates on journeys between Australia and Europe, those venturing to South America can instead pack 2x32kg bags, including on any connecting flights between Dubai and other places like Australia. Extra baggage for frequent flyers: Whether you're an entry-level Blue or Bronze frequent flyer or hold an elusive Qantas Chairman's Lounge card, the baggage allowance on these flights remains the same for all travellers, so you'll need to pay excess baggage fees if bringing three (or more) suitcases. Priority airport services: In Dubai, you can either make use of the dedicated business class check-in hall or the fast-track transit line, and as you'd expect, priority boarding and baggage delivery comes as standard. There's no priority channel for the formalities in São Paulo, but with no queues to 'skip', there was no need. Complimentary airport chauffeur: Included with most paid business class fares. Also available on flights booked using Skywards miles or Qantas Points until February 28 2019. In Dubai, I was collected from my hotel in a BMW 520i Touring, while in São Paulo, the car was a beautiful Mercedes-Benz C180 in both directions. Inflight Internet access: Complimentary for the entire flight for all business class passengers who are also Emirates Skywards members of any tier, when the Skywards membership number is attached to the booking. However, there's limited coverage over the Atlantic Ocean after passing over the African continent until getting much closer to Brazil. An Emirates business class ticket grants you access to the airline's business class lounges in Dubai's Concourse A, Concourse B and Concourse C, and to the separate combined business class and first class lounge at the end of Concourse C, branded as 'The Emirates Lounge'. On the other hand, if you're a Qantas Platinum, Platinum One or Chairman's Lounge frequent flyer or an Emirates Skywards Platinum or iO member, you can also visit Emirates' first class lounges in Concourse A, Concourse B and Concourse C: all feature à la carte dining, while complimentary day spa treatments are offered in the A and B lounges. If you're feeling peckish before the flight and have a Priority Pass membership, you can also visit Bleriot Bar & Lounge in the same terminal, where one 'lounge visit' charged to your Priority Pass account unlocks US$27 (approximately R$100) of food and beverage, similar to the program's airport dining concept in Australia. Currently, Emirates serves São Paulo with a mix of Airbus A380 and Boeing 777-200LR aircraft, with the superjumbo taking the daily return EK261/262 service, and the Boeing 777-200LR serving an extra four flights per week, as EK263/264. On Tuesdays, Thursdays, Fridays and Sundays, EK263 takes wing from Dubai at 9:05am, touching down in Brazil's financial capital at 6:20pm local time the same calendar day after a journey of 15hr 15min. Returning on Mondays, Wednesdays, Fridays and Saturdays, EK264 departs Brazil at 8:40am, reaching Dubai at 4:40am local time the next day, 14 hours later. What's more, EK263 continues onward from São Paulo to Santiago, while EK264 begins its route in Santiago and jets through São Paulo on the way back to Dubai – similar to how Emirates offers Melbourne-Singapore-Dubai flights – although you can just book the Dubai-Brazil part of the journey without travelling to Chile. From June 2019, Emirates will move the Brazil base of its Dubai-Brazil-Chile service from São Paulo to Rio de Janeiro, which will see Boeing 777-200LR flights discontinued to São Paulo (the daily A380 remains), but start running between Dubai and Rio instead, on which passengers can still experience this updated business class seat. In both cases, if you're flying straight through from Dubai to Chile, you'll remain on the plane during the transit period in Brazil, so generally won't need a Brazilian visa: but will need one if entering Brazil using an Australian passport. Australian Business Traveller has previously reviewed Emirates' new Boeing 777-200LR business class seat in detail, so here's a quick recap of what to expect, and how the seat compares with the airline's other business class experiences that you may have flown before. ... and also go fully-flat: two very welcome improvements for the business traveller. ... although in the A380's favour, the superjumbo provides direct and uninterrupted aisle access for every passenger – which the Boeing 777-200LR does not – courtesy of the A380's 1-2-1 seating layout. With a bed length of approximately 180cms, that's 2cm longer than found in the aisle seats on Emirates' A380s, but 20cm shorter than the generous 200cm beds offered in the A380's window seats, just to give some context. But for all its whiz-bang features, as a taller traveller, I didn't find the seat particularly comfortable when sitting in the upright position for take-off and landing, because unlike Emirates' other aircraft, the padded headrest doesn't slide up to meet the back of your head: instead, stuck in place and pressing firmly against my neck and upper back. That wasn't a problem throughout the journey as reclining the seat allowed me to adjust my pose and get more comfortable, but does mean beginning and ending the flight in less comfort than expected. For a closer look at the seat, read our separate in-depth review. ... while after take-off, the full bar opens, from which I selected the fitting Breakfast Martini: blending Sipsmith London Dry Gin with marmalade, Cointreau, orange and lemon juice. A small duo of Godiva chocolates completes the flight, and beyond what's available through the inflight menu, there's also a self-serve snack area in the middle of the cabin which doubles as a place to stretch your legs on these long flights, although the inflight cocktail bar and lounge area aboard Emirates' Airbus A380s will be preferred by many travellers. With a 3am wake-up call that day and having eaten a quick breakfast at the airport courtesy of my Priority Pass membership, I chose the smallest-sounding option in the churros, which were nice and tasty, but I would have preferred the sauces to be in pots for dipping rather than swimming around the plate. Later during the flight, I put an old favourite to the test – an Espresso Martini – and can confirm it was up to scratch! While the outbound flight from Dubai saves the second meal until closer to landing, on this leg, it's served approximately seven hours into the 14-hour journey: essentially a late lunch for those still on São Paulo time, or dinner for travellers already adjusting their body clock to Dubai time. As with the mid-flight snack, I stuck with the South American food theme and enjoyed the meal. While you probably wouldn't make good use of all three controllers during the flight – that is, the remote, the tablet and touching the inflight entertainment screen itself – the trio's advantage is that if one, or even two, of the control methods happen to break while the plane is in the sky, passengers flying in the affected seat until the problem is fixed would still be able to watch their chosen movie, rather than having no entertainment at all. ... but limiting the overhead locker space on this particular jet is problematic, for two main reasons. Firstly, when other airlines choose to skip the central overhead lockers in business class – such Qatar Airways does on its Airbus A350s, for example – larger-than-normal lockers are installed above the window-side seats to compensate, which allow passengers to store bags on their sides and fit more luggage into each compartment, because passengers flying in the middle still have to store their bags somewhere. 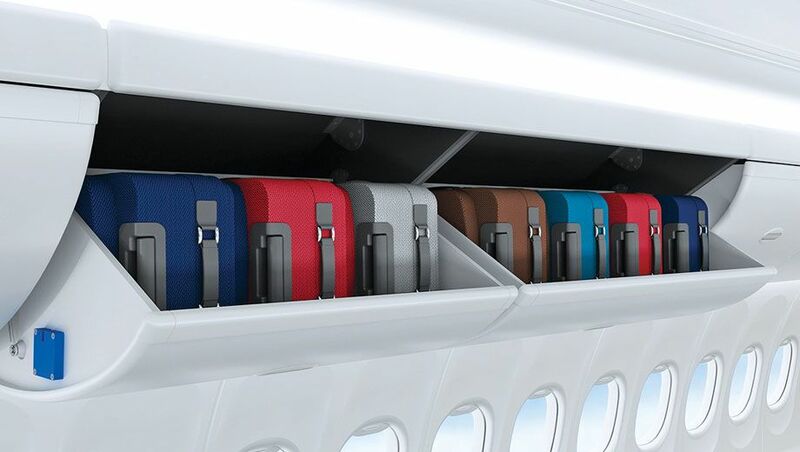 But Emirates hasn't done that: instead, removing the lockers in the middle while retaining only the standard – and relatively small – Boeing 777 lockers down the sides, in which bags can only be stored lying flat. Secondly, with a 2-2-2 (six-across) seating arrangement on its Boeing 777-200LRs compared to the more typical 1-2-1 (four-across) layout as featured on most other airlines that nix the central storage, Emirates essentially has more passengers in the cabin competing for less storage space, which isn't an ideal combination. On the other side of the coin, the biggest advantage of the Boeing 777-200LRs for business class travellers is that there's no first class cabin in front of you, which means that rather than working in first class as they normally would, the Purser and other senior flight attendants work in business class on these flights. Having taken many Emirates flights over the years and across a variety of routes and aircraft types, the service given on these Boeing 777-200LR legs was among the best I've had in business class in a long time, and closer to what I'd expect of first class: and that explains why. All things considered, Emirates' new long-range Boeing 777 business class seat is a marked improvement compared to the 'regular' Boeing 777 business class experience that often appears on flights to Australia, given the presence of fully-flat beds and that there's no more middle seat in business class. The huge (and very crisp) inflight entertainment screen is also up there with the best, and if I were planning to stay awake and watch movies on a flight, that'd be reason enough for me to choose the Boeing 777-200LR over Emirates' Airbus A380, on which I didn't find the screen too impressive on my onward connecting flight. Missing is direct aisle access from every seat, as provided by Emirates' Airbus A380s in business class, but if you do find yourself aboard the Boeing 777-200LR, pre-selecting one of the centre seats has that covered, and without anybody stepping over you. Chris Chamberlin travelled to São Paulo as a guest of Emirates. For tall passengers, the seat pitch and bed length of the hard product is, by far, the most important consideration. No matter how many wonderful other services provided to a premium passenger, it is the cramped conditions that make seats like this, and the new PE on QF, a non-starter for me, and, I imagine, many other taller passengers. You do not pay big $ when there is no seat comfort, even if they pour a torrent of high quality champagne down your throat to anaesthetise you. At 180cm in length (so not even 6ft in the old money), really anyone over 6ft (and maybe even 5'11 ish) are going to be cramped when you factor in for a wheel etc. Sure people might be able to sleep on their sides slightly bent legged etc but far too small. Sadly can't see issues like this changing anytime soon. Good review as always Chris. Those seats!!!!! certainly wouldn't make it my first choice. Chris, your analysis about the seat bins doesn't make sense to me. The typical 1-2-1 layout used by other airlines puts the seats in a dovetail configuration, whereas the 2-2-2 EK layout puts the seats end-to-end. The number of seats under either configuration is usually more or less the same, the layout is just different. Case in point, EK has 24 J seats in Zone A in a 2-2-2 layout; AC has 26 in a reverse herringbone configuration. You still have the same number of pax competing for the same locker space. It's a broad comparison to illustrate the issue: the exact number of seats fitted between exit doors and the measurements and other dimensions of those seats will naturally vary between airlines and aircraft types – the key issue is that Emirates has removed the centre overhead lockers while still providing only small lockers down the sides, which is not the approach other airlines take, as the article explains. Using the specific Air Canada example you provide, Emirates has 24 passengers in 'Zone 1' competing for only half as many lockers (and just the smaller, outer lockers at that) as Air Canada provides in a similar space that houses 26 passengers, but which has twice as many storage bins with lockers also found in the centre, which are also typically the larger of the two. Great review, thank you. One day EK will get with the program regarding 1-2-1 seats in J.
I love the new look of the Emirates seats. Shame about the shorter dimensions. I’m sorry but I don’t find your review objective , as you were a guest of emirates I’m assuming the crew knew you were a review passenger and you experienced the ‘good’ Emirates. The reality is I fly EK twice per month to Africa and South America and the EK experience today is appalling. Service is absolute rubbish , and that’s with half of my flights in First, EK are obviously in trouble, the cutbacks make them more Like a glammed version of Jetstar than a truly world class airline they used to be. My 16 hour layover in the first lounge in DXB In concourse A proved what I had suspected, the place was dead, the Mackay QantasLink lounge is busier and to be honest a more pleasant experience (I don’t get asked for tips in Mackay that’s for sure). Staff experience at EK has disappeared, with a very obvious increase in crew turnover , the fake berocca tablets and other things are just plain cheap. Why do I fly EK, well unless I want to go to London or Paris and backtrack I have no choice, EK used to be a world class experience but it is far from it now, and as a sign off , if any other airline bought out such an outdated business product like Emirates, AusBT would not be as praising in its review. PS you guys generally don’t like your readers being critical of you or your articles , let’s hope you have some journalistic integrity and publish this review. Hi flatearth, the comments section under each article is provided for readers to discuss the topic of the article among themselves, not to write direct messages to authors or editors, which is what email is for. Nonetheless, on this occasion, I would simply remind that this is a review of a single return flight between Dubai and Sao Paulo – not a review of the Emirates first class lounge in Concourse A, the Emirates first class experience, Emirates' broader international network, flights to Africa or anything else that you seem to be personally disappointed with, and would also remind that at the end of the day, we fly in the same seats as every other passenger in the same cabin, and order food from exactly the same menu. We're also not going to engage in debates with you about "objectivity" or "journalistic integrity", as this highly detailed review of 3,651 words and 44 photos speaks for itself. Moving forward and as you're already aware, any further off-topic comments stand to be removed in line with AusBT's published comment policy, but as always, you are welcome to email the writer or editor responsible for each story. I think Emirates food is the biggest disappointment. Having done 8 Business flights with EK and 14 with Qantas there is no doubt that Qantas’ food out classes EK every time. EK is all about quantity with their business menu akin to a 1990s function at the Wentworth with alternate settings. Genuinely most of EK’s main meals are inedible. Your comments are spot on , I was on the DXB-AKL flight in first last week, there were 2 of us in the cabin , I gave up pressing the call button and went and asked for my own drink. And when it cam to meal selection, the response , sorry sir but we are out of your choice (2 in the cabin) means a lot of what they claim to have is all myth anyway. I agree flat earth - I flew FCO to DXB 3 weeks ago and waited for an hour for any cabin crew to come through the cabin then decided to go to the bar to get water myself an there were 11 (seriously) Cabin Crew sitting and standing in the bar chatting amongst themselves. If it wasn’t so unsafe I’d have found it funny. We recently flew business from AKL to DPS. We regularly fly with SQ and this was our first experience with EQ. Never again. We had requested vegan meals and even the cabin crew were embarrassed to serve us. I have attached a photo of the Light meal we were served . The main meal was equally disgusting . Looks like light vegan meals were not available and the crew improvised. Nope. That was actually loaded onto the flight. I'll stick to QR thank you. The 'new' ER 2-2-2 reminds me of the old QR 777 ER arrangement but with heaps more 'bling'. I last travelled ER two years ago across the ditch to CHC and it was 2-3-2. Very narrow seats and three hours of that was enough. In regard to cabin service, I cannot comment on ER other than a family member recently travelled with them to the UK and back and described their on board service as absymal in both directions. Comment on "Emirates Boeing 777-200LR business class (Dubai-São Paulo-Dubai)"